Sauces, in case you haven’t realized it yet, are one of my go-to, always-on-my-mind solutions for almost any meal. I was going to say “protein”, but I make dessert sauces and fruit sauces, too, but today we’re going to focus on the savory. This is an after pan-frying type of sauce. You want the good stuff left behind in the pan from the meat you just pan-fried. You want the “fond”. That’s what those browned caramelized and concentrated bits of heaven are called. They hold the key to sauce-Nirvana. To retrieve them in all their glory, you pour a small amount of liquid into the pan, or “deglaze” the pan. I love to deglaze a pan with wine and brandy (or bourbon or for a non-alcoholic options, apple cider or orange juice). This loosens those bits so you can make the sauce that will become your go-to sauce. You will maybe add some other things, like shallots, onions, mushrooms, nuts, peppercorns, herbs, Dijon mustard, Worcestershire sauce, etc. and then comes the heavy cream. I’m growing misty-eyed just thinking about it. Heavy cream gives any sauce depth, nutty richness and texture. Yes, texture. I consider that creamy, velvety mouth-feel you get from heavy cream reduction, a texture. There is nothing quite like that feeling; you want another bite, then another and another. You begin considering ways to fill a bath tub with it and dive in head first and you are definitely thinking about what other things you can make to use this sauce on. Sauces will become an obsession and your signature. Sauces, your sauces, are what friends and dinner guests will forever associate with you. They will love and adore you; they will revere you and your cooking prowess. Only you will know just how simple this whole process is. We’re going to make Peppercorn Sauce today. This is excellent with steak, lamb, venison and pheasant, but you should use it on whatever you want. By the way, it takes a hamburger to a new level of flavor and sophistication. Add the butter, shallots and mushrooms, if using. Sauté over medium-low heat for 3-4 minutes, stirring and scraping the bottom, until the shallots soften and become translucent. Add brandy, the wine and green peppercorns to the skillet; bring to the boil, scraping up any browned bits (the fond). Continue to cook, until the liquid has almost evaporated. Add the stock and reduce by about half. Add the heavy cream and boil until reduced to sauce consistency, about 2 minutes. Whisk in mustard, if using. Season sauce with salt if necessary. Pour sauce over or under steaks and serve immediately. 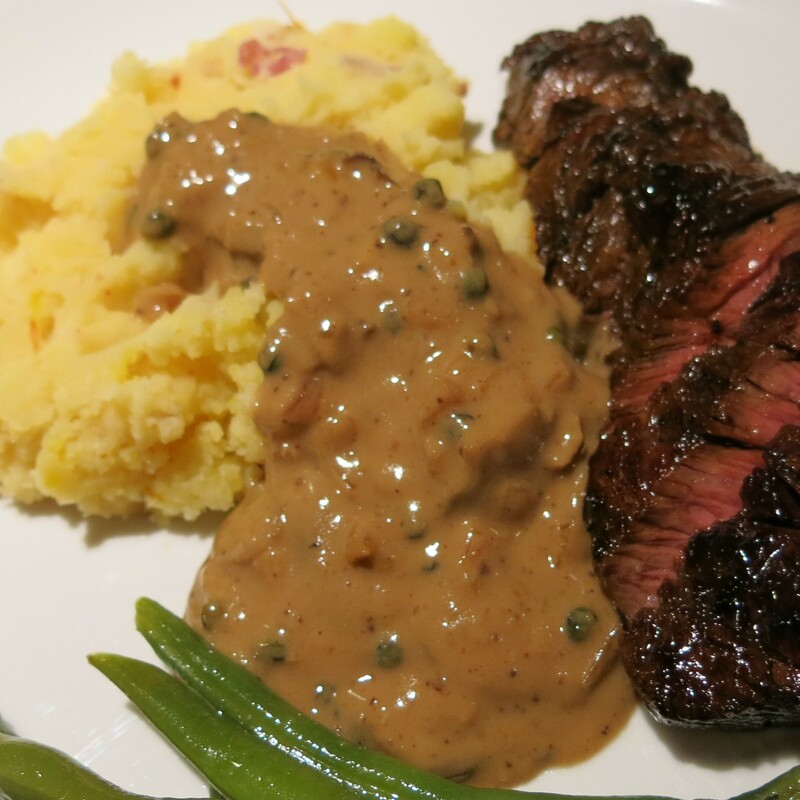 Green Peppercorn Sauce Recipe©Marcia Lahens 2014. All rights reserved. That’s all there is to it! 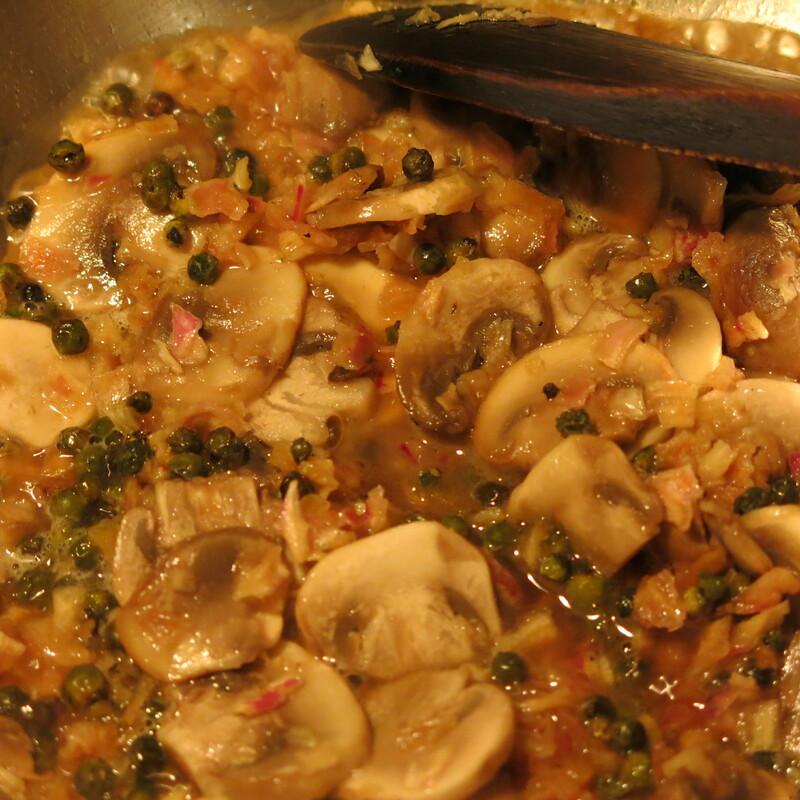 I used shallots, mushrooms and only green peppercorns (I left them whole, too), but with chicken or pheasant, I would use pink peppercorns and perhaps part green peppercorns. 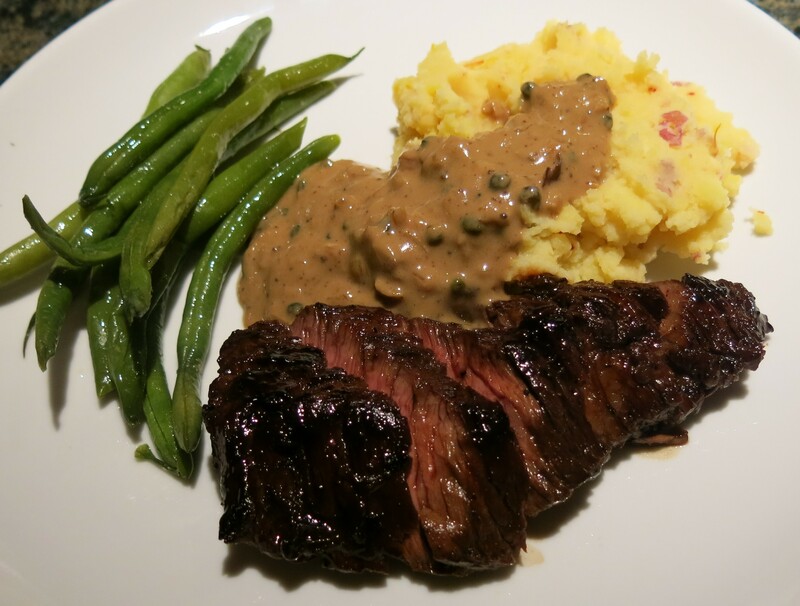 With lamb or venison, I might add some rosemary and I would used Tellicherry peppercorns. Just as an aside, you should consider using Tellicherry peppercorns. They are truly the king of peppercorns from a flavor standpoint. They are more nuanced. They have some floral and fruity properties, some grassy notes and just seem to add a bright flash of flavor. But, whatever type of peppercorn you choose to use, freshly ground right before you are going to use it, will give you the most and best flavor. Pre-ground pepper, yes I have some in my cupboard, but it just doesn’t have the flavor that freshly ground pepper has. It isn’t difficult to find whole peppercorns. They are sold individually by color–green, black, white or pink (though pink are not true peppercorns, botanically speaking-more on that another time), you can purchase a blend of all four, as well. The Spice Mill has all the individual types, the blend, as well as Balinese long pepper and Grains of Paradise (West African Malagueta pepper). Yet again, I digress. Sauces are, without a doubt, a most important element in cooking. I started this blog with sauces, because they are so flexible and add so much flavor to simply prepared food. They are quick to prepare; it usually will take no more than 10 minutes and can be made while the meat rests. Slather them, nap them, bathe in them if you wish, but use them to make the ordinary, quite extraordinary!